Nokia Networks manufacturing operations has received five “Recognized for Excellence Awards” certificates from the European Foundation for Quality Management (EFQM)*. 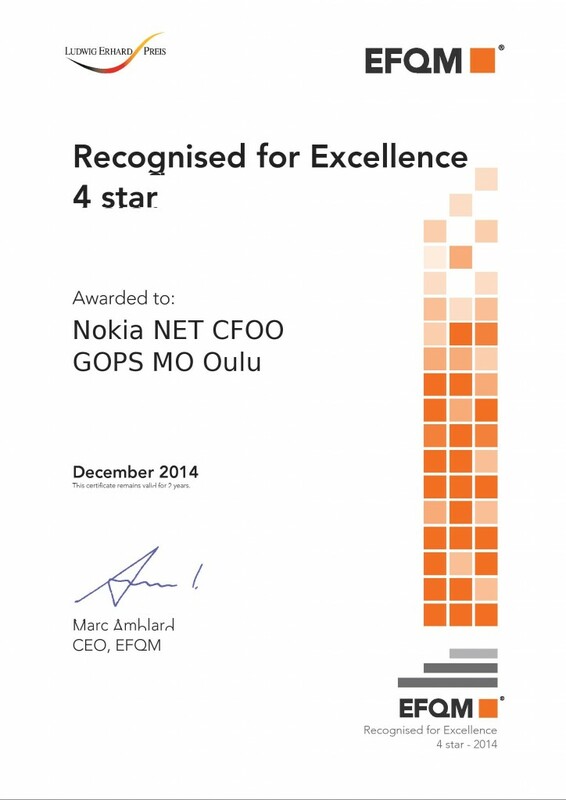 This is a major step forward for Nokia Networks manufacturing operations on their commitment to excellence using the EFQM Excellence Model. The scope of the EFQM assessments that occurred in late 2014 covered hundreds of Nokia Networks employees, in addition to the Nokia Networks factories in Oulu (Finland), Chennai (India), Shanghai and Suzhou (China). The result was one “4 Star Recognized for Excellence” and four “3 Star Recognized for Excellence”. The lessons learned from the assessments will be used to further improve Nokia Networks manufacturing operations under the leadership of trained company EFQM assessors. “Excellence requires systematic and structured development work. These EFQM certificates are earned with holistic understanding of the business, solid strategy deployment, and fact-based management applied for several years. Nokia Networks manufacturing operations is committed to continuously raising the bar to keep up and stay ahead with its best-in-class manufacturing operations,” stated Karl Kirschenhofer, vice president of Nokia Networks manufacturing operations. * The objective of the EFQM Excellence Award is to recognize Europe's best performing organizations, whether private, public or non-profit. It recognizes industry leaders with an indisputable track record of success in turning strategy into action and continuously improving their organization’s performance. Please share your thoughts on this topic by replying below - and join the Twitter discussion with @NokiaNetworks using #NetworksPerform #mobilebroadband #Nokia #Quality. Liisa Sareela is a global marketing communications professional at Nokia Networks and a Quality evangelist. Her career extends over 10+ years in corporate communications and business transformation. Liisa holds a Master’s Degree in International Business Communications from the University of Oulu, Finland.